I sometimes wonder what my homes have seen. During college, I lived in the upstairs apartment of a house that had been remodeled because the previous renter had died in a fire in what was to become my bedroom. 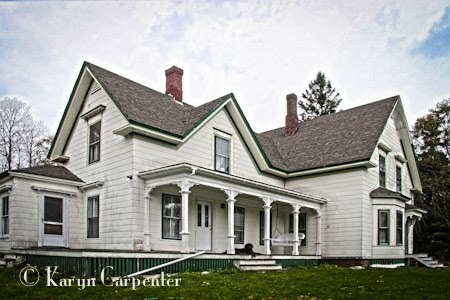 Another home was haunted. Lights that I'd never turned on would flip on in the middle of the night by themselves. Doors would open, things would move around. The woman I bought the home from believed me when I told her the stories. The house had been built for her mother (called Mongey by her grandchildren) who was a real character. She'd run off and joined the circus when she was younger and even as an old lady enjoyed things like palm reading. I knew it was Mongey who was haunting the house. In fact, I had been renting the house but the horrid wallpaper with enormous floral patterns was making me nuts, so, in order to strip off the paper, I had to buy the home. I figured that Mongey was hanging around to see what I was doing and once the remodel was complete, she moved on. I kept the home as a rental for 20 years and no one complained of Mongey after the remodeling ended. Chris Robb bought her 150 year old Isleboro Maine home some 30 years ago when she first visited the island. 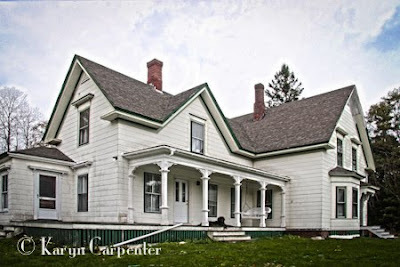 At the time she lived in the midwest, but fell for this darling farmhouse and had to have it. During the years, she has slowly made improvements - putting in a real kitchen and bathrooms, and removing linoleum which had been glued to the old parquet floors (their existence was a total surprise, though they were so ruined by the glue that they weren't restorable). She saved for the day she could replace old wiring and plumbing. As often happens when walls are removed, "things" presented themselves that had been buried for years. For Chris, the house gifted her a story of its past in the form of a bundle of letters. Still in their original envelopes and dated 1903 - 1911, the letters were written by a teenage girl to her boyfriend who was working at sea. They told of her life on the island, of working in a local laundry, of walking in winds so high that her skirts flew over her head. They hinted at possible scandalous events. Did the boy hide the letters for safe keeping so they would not be found by his parents? Were they forgotten, or did they slip to a place that left them unretrievable? Some research revealed that the couple did eventually marry and the boy's grave located. Chris isn't finished with this story, yet. She is playing with the idea of transcribing and publishing the letters. If your walls could speak, what would they reveal? Photos: Chris Robb's home on Isleboro Maine presented her stories from the grave. 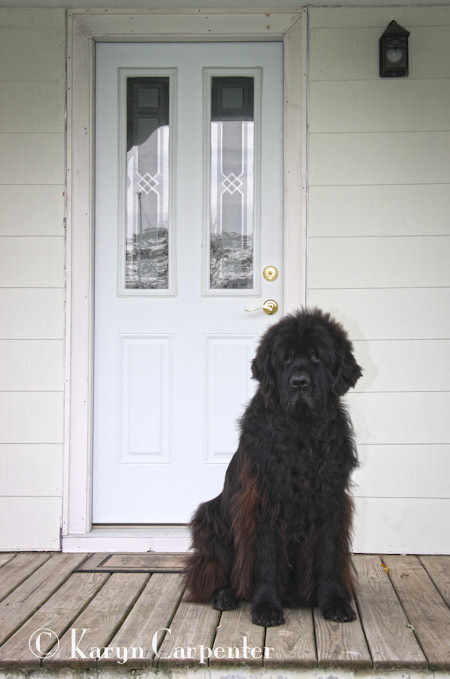 Her Newfoundland, 9 Volt, guards his front door.